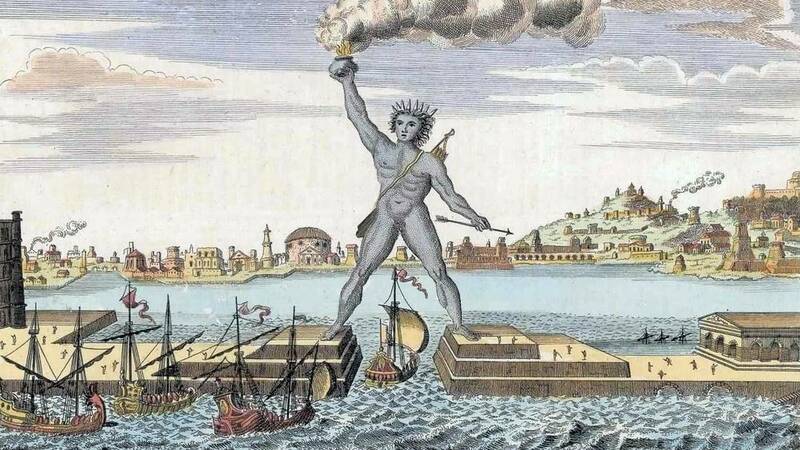 Performance of the Colossus of Rhodes, invariably represented one foot on either side of the entrance to the port. 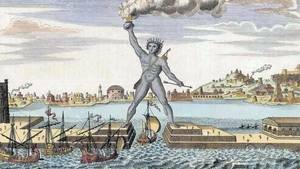 The sources that inspired the Statue of Liberty are multiple, but the main course is the Colossus of Rhodes, the sixth wonder of the world that was located at the Rhodes harbor entrance to serve as lighthouse. It was destroyed by an earthquake. You should know that Auguste Bartholdi presented twice a construction project of a gigantic statue to position the Suez Canal entrance, a statue that strongly resembled the future "Freedom". The project was to reproduce the goddess of freedom of the Roman pantheon Libertas, in the guise of an Egyptian peasant. The similarity between the two projects is striking, even the name of the works, "Liberty Enlightening the World" for New Yorkers work and "Liberty Enlightening the East" for the Egyptian project. This site features an engraving of the initial project planned for the Suez Canal on the Origin of the Statue of Liberty. But art history has bequeathed us various representations of men and women standing torch in hand. This is the case of "The Truth," a 1870 painting by Jules Lefebvre (now in the Musée d'Orsay) Indeed, the man (or woman) standing proud (e), he argues, safe from him. The light that illuminates its surroundings door, as a guide. It is therefore natural that this representation have always served to express the confidence, strength, serenity, will, etc. 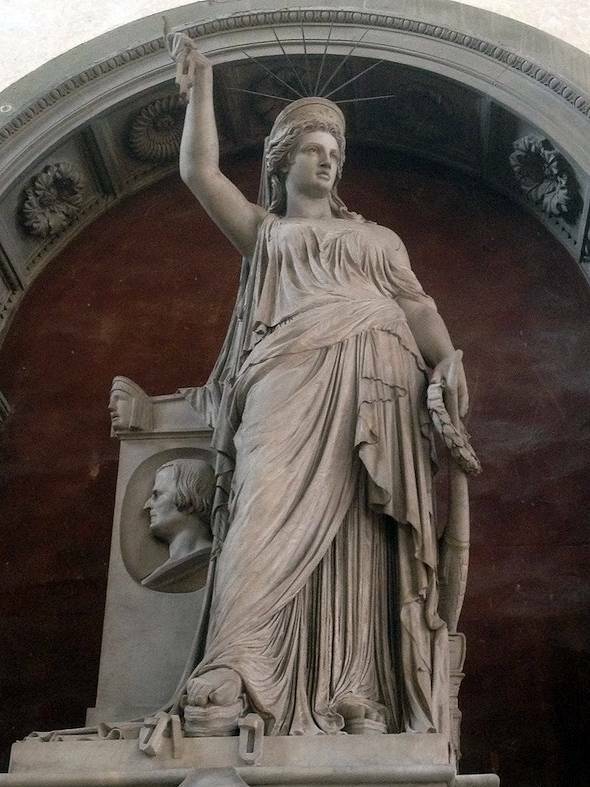 The Florentine statue represents The Liberty of Poetry, and thus the freedom of art and of creative genius in general. What this statue inspired Bartholdi, we probably never know, but we must point out the many similarities. First, the general posture, standing, left arm lowered the raised right. Then her dress identically made a toga, and especially its crown, almost identical to each other. The outgoing radiation is probably the strongest resemblance can be found at first glance. Because if we look closer, the most obvious similarity is symbolic: The two statues are symbols of freedom, that of New York has "broken the chains of slavery" at her feet, barely visible, that of Florence holds them in hand. The piece at her feet is more visible. Finally the main differences relate only to the obvious symbols: The lyre of writer-poet is replaced by a tablet marked the day of American independence, and the broken chain with a torch, symbol that highlights the future an enlightened world that the past disposal of human beings. The other more anecdotal differences: The toga that is not draped in the same way, its not right arm, and then the fact that it suggests that the colossus is static. Rest the face, soft as the ancient statues for the Florentine as he is more severe for New York. The answer seems simple. The poet Giovan Battista Niccolini died in 1861 (1782-1861, exactly). This memorial was commissioned for the 10th anniversary of her death, so in 1871. It was completed in 1877, but it has been installed and inaugurated in 1883 in Ste Croix. Such work required a lot of different skills and the modern world of artists communicated a lot, the plans of the sculpture had to reach Bartholdi which was part of French artistic circles, he was already well known in France for her first works. 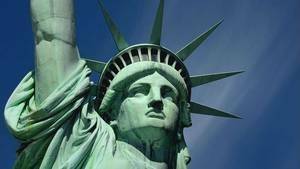 For it is in 1865 that Bartholdi became known for the construction of Miss Liberty. He was already working on a gigantic statue to be placed at the entrance of the Suez Canal, a project that was dismissed as too much cost. The statue looked like the current statue of Liberty, but without the symbols. However, these symbols are visible on the work of Fedi. It seems logical that Bartholdi has taken in hand the plans of this statue and I took what interested: chains of slavery, crown radius. 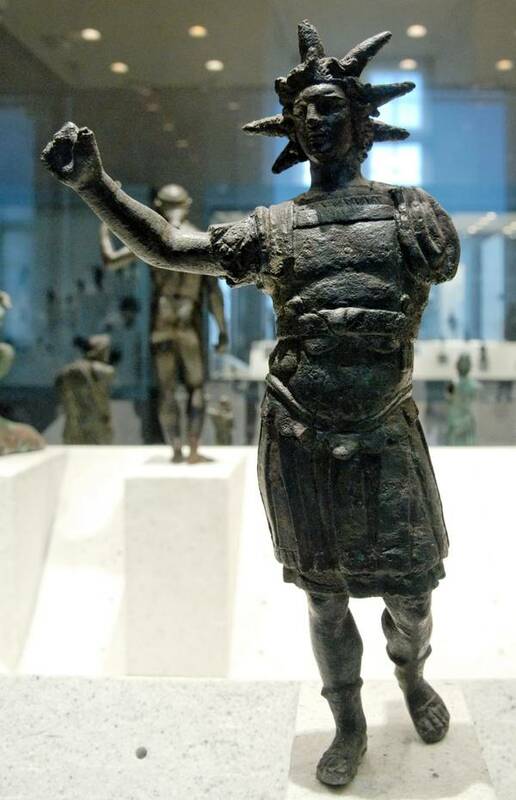 The rest, he already had: Posture, toga stature. We know that Bartholdi reworked her Egyptian project in the early years (1865-1971) and is known to have made her first trip to the United States in 1871 to provide a location. 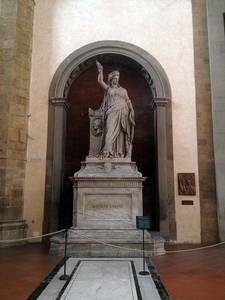 We can estimate that 6 years has had time to provide precise maps of her work, so it is unclear how the work of Fedi was able to influence the overall look of her statue, he had already set years before. Arguably safe to say that yes, the memorial of Giovan Battista Niccolini is a source of inspiration, but for symbols only. Statue of Helios, visible at the Louvre, Paris. Helios is, according to Greek mythology, the Sun God. Her cult is related to the light. It is often depicted with a crown of solar rays above her head, to be exact, there are 7, almost always. Thus it is shown below against statuette, which is visible in the Louvre. Another is also visible in the form of a bronze bust, always with the 7 rays from the top of her head. 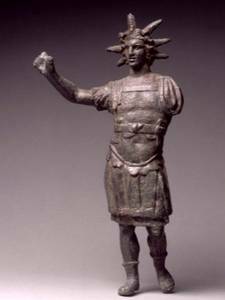 Over the centuries was mistaken for Helios Apollo, then assimilated to the Egyptian God Ra, the Sun God, too. Given the similarity of the 7-rays with the Statue of Liberty, we can believe without much problem Helios participated in Bartholdi choices made about the presence of these rays. Note that Sidney Barclay artist made a woodcut in 1880, ie during the construction of the statue, which is represented on the Colossus of Rhodes wearing a crown 7 rays. To say that he drew plans of the Statue of Liberty, there is only one step ... you can not pass without more evidence, because Rhodes was under the protection of the Sun God, it is logical that it be represented with a tiara and rays, as is the case elsewhere on the image above. 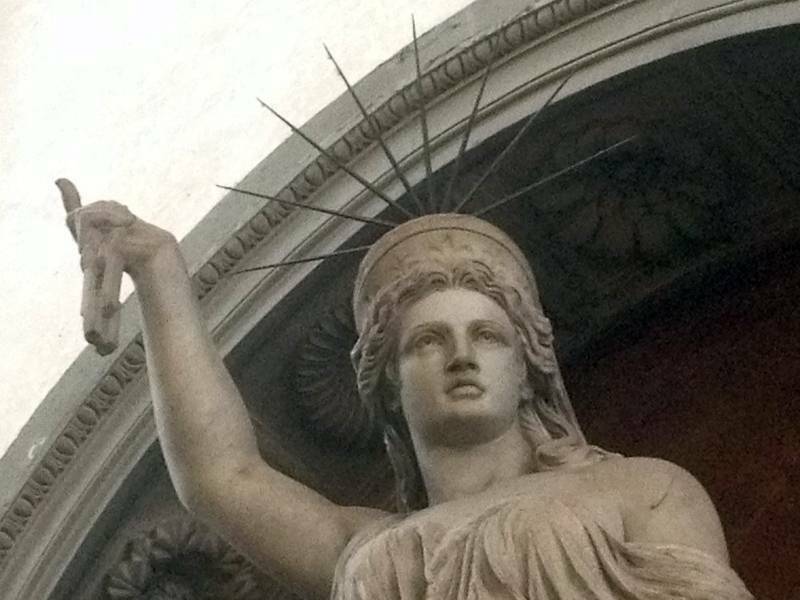 This statue is not a source of symbolic but technical inspiration for the Statue of Liberty. 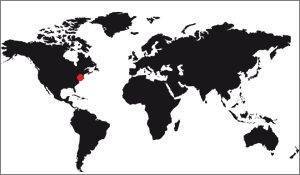 It is located near Lake Maggiore, Italy, Arrona. It is close enough to the New York statue by its large size (23m40, 11m70 more for the base), and above all by design, embossed copper, as its US sister. It was conducted by the CERANI sculptor who worked there in 1697. The following description comes from the magazine "French genius", as the title specialized lets suppose in the explanation of the great engineering works in France. It was written as an example of existing statue at the creation of the Statue of Liberty, late nineteenth. 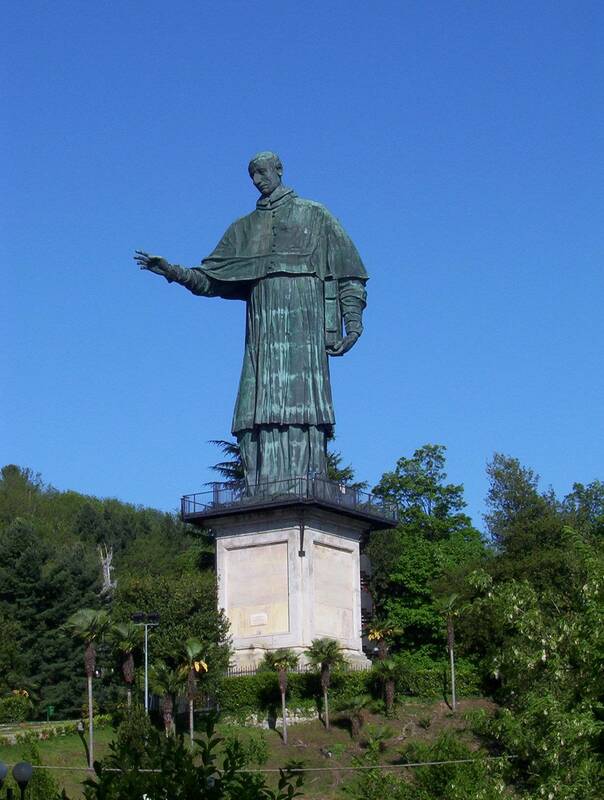 The monumental statue of St. Charles Borromeo, Arona (Italy). 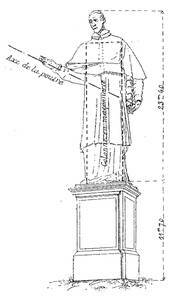 Diagram of the monumental statue of St Charles Borromeo, Arona (Italy). 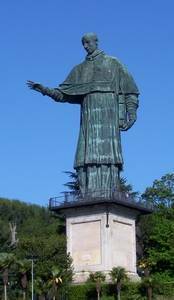 The statue is formed of a delayed copper envelope supported by means of clamps and iron frames by an interior solid masonry which is almost tangent to said casing and rises to the neck. The copper sheets have only 1.5mm thick (2.3 for the Statue of Liberty), they have not been hammered on jigs, but directly by hand. These plates are poorly attached by large rivets them spaced 40mm (25 for the Statue of Liberty), adjustment is very crudely done. They are connected directly to the masonry by means of pegs and iron hooks. To increase the rigidity of the inside was applied thereto envelope flat steel plates of 13mm which intersect vertically and horizontally about 1m distance. These irons spend on each other without any attachment, only here and there a big copper rivet connects to the envelope. The right arm, which is in an almost horizontal position, is supported by a large oak beam 35 to 40cm rendering sealed in masonry (Today, it is metal). This beam is armed flats irons, like a ship yard, and is supported by sealed rods in stone; all assemblies are keyed and coarser. The timber is now completely decayed, and there remains only the frame. The left hand holding a book, is supported by three round iron rods suspended from a 20mm iron gallows itself is sealed in the masonry. 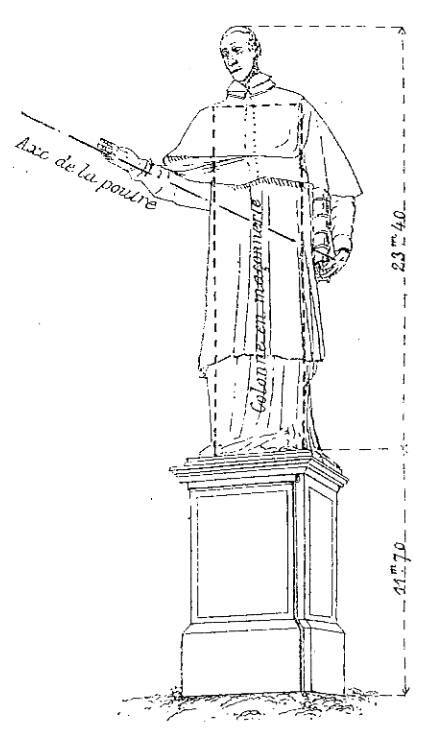 One enters the statue through an opening hidden under a fold of the blade and which is reached by ladders. Inside, the ascent is quite painful: You have to climb up a chimney species, with the help of iron spikes that connect the envelope to the masonry. As seen in this description of the nineteenth century, there was a lot of similarity between the two statues of interest. The Italian, though it is smaller, however, can be considered huge, one can get inside and climb to the top. It is made of copper plates pushed assemblies, but the assembly is much thinner for the New York statue. The heart was initially to be masonry for both, but the intervention of Eiffel in the project was that the idea was abandoned, replaced by an iron frame. Finally the hooking techniques to structure the copper shell have been improved to the Statue of Liberty, but the general principle is the same. In many ways the two statues are similar, two centuries apart. If it is obvious that the Statue of Liberty has many sources of inspiration, it is itself a good source of inspiration for a lot of people. Advertising is no exception to the rule, but this economic area is nothing compared to the countless areas in which the statue appears. And that's not counting on individuals, each with her own vision of the statue. You have on this site a lot of information on the popular imagination, seen through the statue, and this in art, advertising areas, educational, entertainment, etc.